Photo: The view from my front window of my apricot tree in full bloom. In the foreground is a forsythia bush. I messaged Territorial Seed Company about the possibility of them re-introducing a pepper seed they carried around 1998-2002, and they took the time to check with the farm manager and get back to me. I called VPI (pet insurance) company about a very old check I discovered that I hadn't cashed. Not only did the customer service representative tell me that she would get the check re-issued, she called me back the next day to say that she couldn't do that because it had already been turned over to California lost property. She gave me the number to call to claim it with California. 7. I'm thankful for Drexel, and for the groomers that give him his monthly bath. Drexel loves to go there, the groomers love to see him, and I get a clean dog in return without getting wet myself. Win-win-win! 8. I'm thankful I've discovered treasures while organizing my office, including an email written in 1995 from my dad advising me to "Check out aolnet. . . .I am going to download the recent Mac version of AOL to see if I can view the WWW (World Wide Web). I don't know anything about it except some friends say it is the best thing going presently." Yep, that WWW has certainly become something, all right! 9. I'm thankful for signs of spring. I hung a bird feeder and, gathering from the frequency with which I need to refill the feeder, am currently feeding Utah's entire population of birds. 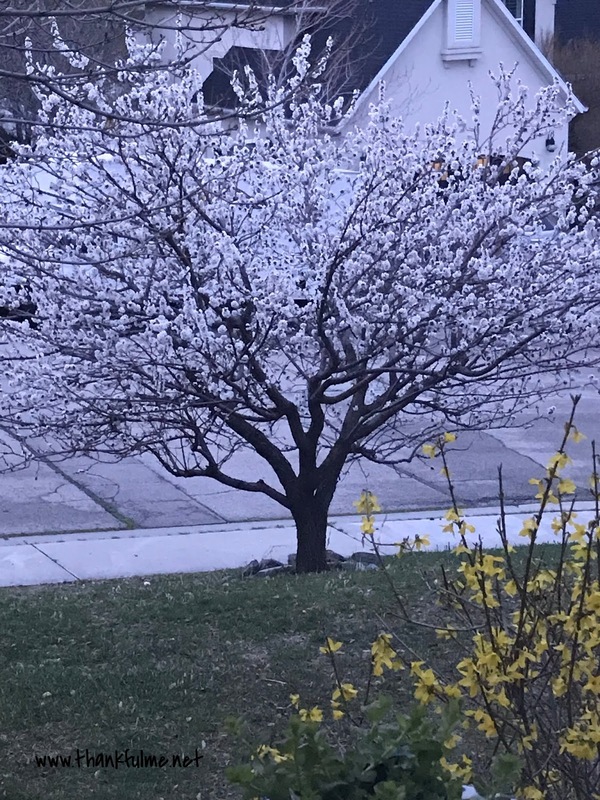 The apricot tree is in full bloom, daffodils are popping up, and the forsythias are blossoming. Spring is such a beautiful season, and no longer do I have a sense of dread about the season that follows. Summers are pretty pleasant, when they don't involve weeks of triple-digit temperatures--go figure! 10. As always, I'm thankful for John. Well, this "quick list" has taken me more than a day to get published, but fortunately, the blog hop is open until Tuesday night. Come join us! I'd love to hear what you are thankful for this week. I love the "white on white photo" at the top of your post! That will be amazing if you will be able to claim the check with California. It is worth a try, and if anyone has a chance of this happening, it is you. Yes, I can foresee another budget item in the future for you---Birdseed and suet. Each state has an unclaimed property division, and it's actually quite simple to fill out a request. We are definitely going through birdseed quickly! Wishing many happy returns to your daughters, and good luck with the organization of the office! Sweet things to be grateful for and found money WOOHOO!! Now, to claim it. Nice! Direct and to the point... enjoyed the list. (Wish Una enjoyed the groomers. The second time I took her she began back pedaling at the door and shaking once inside. Needless to say, she and I made a break for the car and got away clean). I think Una's reaction is probably more typical of most dogs. Drexel just loves everyone and everything. I wish we had apricot trees! They are gorgeous, and you can sing the popcorn song every time you see one! I wish you luck with your office organization. I always mean well when I set out to do something like that, but then I get caught up in the things I find (hmmm, like you seem to - hee hee) and I become part of the Give A Mouse A Cookie series and I never finish. Happy birthday to your girls, and I'll bet the next sweeper models have the on/off switch moved, all because of you! 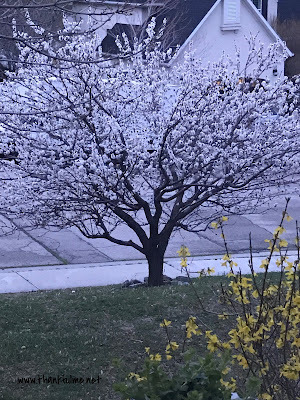 Apricot trees are beautiful, but I'm not convinced we'll get a good crop of fruit this year--it is supposed to snow over the next couple of days!